Home Project Centre Limited Group (HPC) is a 100% privately owned Irish business currently trading from twelve locations in Ireland. 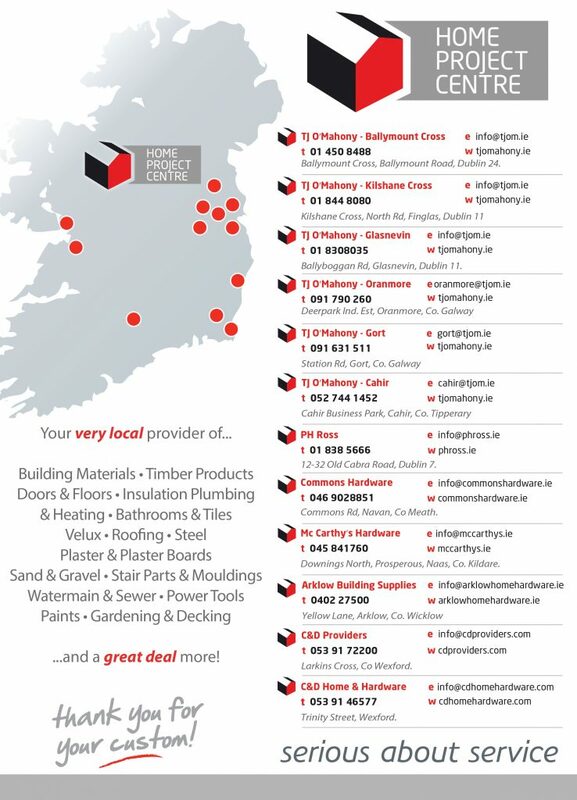 All our branches are long established businesses and operate under widely recognised and well respected trading names including T J O’Mahonys, C&D Providers, PH Ross and McCarthys Hardware. Our branches stock all the leading and recognised brands in timber, building materials, plumbing & heating and bathroom products, tools, paint & decor and a wide range of DIY, household and gardening products. Having grown significantly in recent years to become one of the leading industry players in Ireland we now employ over 250 people. Our dedicated and knowledgeable staff are always on hand to help and are committed to maintaining the highest standards in service for all our valued customers. As we say we are “Serious about Service”.